Never judge a book by its cover. That is one of the lessons of The Casual Vacancy, the J.K Rowling book adaptation that was a three hour miniseries on BBC and HBO. Pagford seems like a quaint, idyllic English town with ancient buildings and a cobblestone square. However, below the surface lies the horrible truth that most of the town's residents are less than admirable people. When Barry Fairbrother, one of the voices for the less fortunate in Pagford, dies unexpectedly, his seat on the town council is up for grabs. More importantly, whoever wins that seat will have the deciding vote as to the fate of Sweet love house. Currently used as a community center for the less fortunate, some members of the council want to turn it into a spa and retreat for the rich, leaving those in need stuck without services. When three candidates for the spot come forward, each have their own "skeletons" to battle against and one member of the town uses the internet anonymously to shame each of them. We see the backstabbing and intertwining of these families and ultimately the devastating effects ruthless tactics take upon, not only these individuals, but the other residents of the town. Those expecting a Harry Potter like fantasy will be sorely disappointed as The Casual Vacany couldn't be further from the whimsical world of wizards and witches Rowling is known for. The plot exposes the gritty underbelly of greedy and selfishness ever present in today's society. From the snobbish elder statesman of the town, with his conniving wife, to the teenage girl trying to keep things together and care for her younger brother while her mother is strung out on drugs, the film makes you experience the more unpleasant emotions of anger, pity and sadness. The best part of this series is the casting. Since this is an ensemble each character needs to stand out on their own and with veteran British actors like Michael Gambon (Harry Potter and the Deathly Hallows: Part II) and Julia McKenzie (Agatha Christie's Marple) that happens brilliantly. Their air of sophistication and maturity adds a subtle element to the back stabbing and biting nature of their roles. Newcomer Abigail Lawrie is magnificent as Krystal Weedon, the teenage daughter of a drug addict trying her best to keep her family together and make something more of her life. The video presented in 1080p High Definitions allows the viewer to appreciate the beauty of the landscape and scenery in England. The contrast of the "ghetto" and the old village is vividly clear. DTS-HD Master Audio 5.1 is standard and works well with the video. I will say, that as an American, I had moments where it was hard to understand the actors, but that had nothing to do with the audio quality and everything to do with the accents. The extras are interesting enough with standard fair such as the casting of the film and adapting the story from novel to screenplay. Download The Casual Vacancy from the iTunes Store in Digial HD. 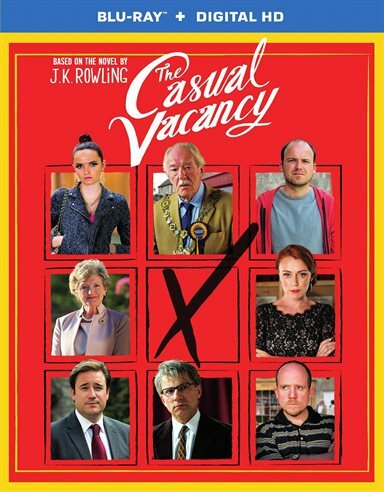 For more information about The Casual Vacancy visit the FlickDirect Movie Database.